The first few times I came to visit NYC, I spent my time in Midtown and Downtown, and never visited the Upper West Side. So close, only a hop, skip and a jump away, yet I never managed to head uptown. Of course I was busy shopping up a storm in Chinatown, but that is a story for another day. 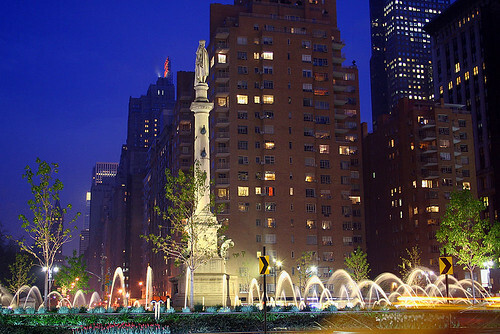 Today I’d like to tell you about a favorite place of mine, Columbus Circle. It is here a weary traveler can find refuge from the merciless streets of NY. It’s a haven of peace tucked in the midst of the traffic melee that circles it like a vulture seeking it’s prey. Behold the circle at night. When my old DC Roommate came to town to bid me farewell before setting off to travel the world, literally, we spent a couple of blissful hours sitting under the shadow of Christopher Columbus, and listening to the rush of water that surrounded us. In the middle of the round-about, is a sitting area perfect for resting your aching feet and your heat-stroked-self. Shooting fountains ring the statue producing a cooling affect to the ease the weary traveler, block out the sound of circling trucks and taxis, and the groups of people sitting a few paces away. Broad benches mirror the curved water features providing a great place to sit. If you’re hungry and need sustenance, delis and restaurants are just around the corner, but my favorite place to grab food, at Columbus Circle, is at Whole Foods just a few paces away. They have choices for even the pickiest of eaters, pizza, sushi (the wasabi packets are darling), soup, Indian food, sandwiches, and a few huge salad, hot food, and dessert bars, plus much, much more. To get to Whole Foods, cross the street toward the Time Warner Building. Enter the building, take the escalator downstairs, you can’t miss it. Whole Foods is the downstairs. When inside the Time Warner Building, take a picture of yourself next to the giant bronze statues of the naked man and woman (get your mind out of the gutter! they stand about thirty feet apart). I’ve never done it, but everyone else clamors to snap a picture. Go see Jazz at Lincoln Center, conveniently located in the Time Warner Building. If you want a really NICE sit-down dinner you have several choices inside the Time Warner Building. Might I suggest the Cafe Gray, a daughter of a friend worked there as a pastry-chef. 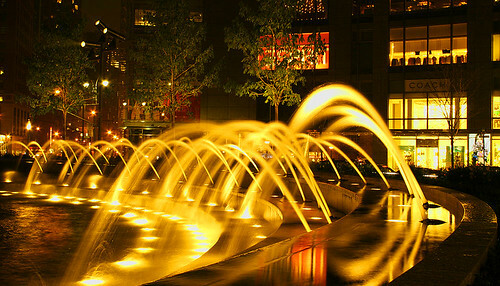 Walk up to Lincoln Center, the lights are pretty at night, or catch a concert. Hire a pedicab to wheel you around Central Park or anywhere else your heart desires. Buy a framed pictures or prints of NY Cityscapes from the stand that is ALWAYS set-up next to the row of pedicabs. Disclaimer: As a rule, don’t go to any NY parks at night, especially if you are alone. The only exceptions to this rule is if you’re taking a ride in a carriage around the park, or if there are lots of people out and about, for example after a concert in the park, or during the New Year’s Eve fireworks, etc. Found this, and love the shots and commentary, so linking at my blog; hope okay.